This time, even Aden's passionate determination may not be enough - because the emotionless chill of Silence existed for a reason. For the violent, and the insane, and the irreparably broken . . . like Zaira. It's not often that you can reach book 14 in a series and still honestly say that you love everything about the world an author has created but that is exactly how I feel about Nalini Singh's Psy-Changeling series. I don't know how she manages to keep this series so fresh but every single book just gets better and better and with every new instalment I find myself with a new favourite in my hands. 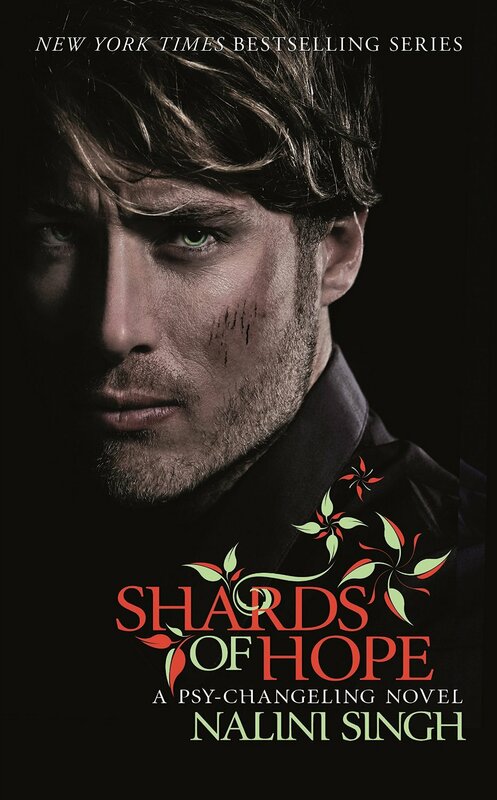 I had high expectations for Shards of Hope but it still completely blew me away, this was probably the book that took me on the biggest emotional journey of the whole series and I loved every minute of it. With the fall of Silence we have already seen one major plot arc come to an end but there is obviously plenty more to come and we are now getting to see the full impact of these changes. The loss of Silence has had meant huge changes for the entire Psy race but the Arrow squad are finding it harder than anyone, they have such incredibly powerful gifts and Silence was their safety net so they're feeling lost and unsure without it. Aden has given his whole life to the squad, he was never fully Silent but he was able to keep that hidden and use his abilities to protect the others. Now he wants to see his team not only adapt but thrive in their new environment, he knows there has to be a better way for the Arrows and he is determined to find it for them. I don't want to say too much about what transpires but I will say that I absolutely loved the direction he is taking them in, we get to see some absolutely beautiful moments with the squad and I found that part of the story incredibly emotional and heart warming. Aden has always put the squad first, it's something that shows what a great leader he is and how worthy he is of their trust but he does have a tendency to put his own needs last and he really needs someone to look out for him occasionally. I love everything about Aden, he's honourable, sweet, protective, caring and funny too, he cares so deeply about the whole squad but Zaira has had a special place in his heart since they were teenagers and now he's determined to act on it. Zaira survived a hellish childhood but it left her damaged, she has a rage deep inside that terrifies her and she's always been afraid to let anyone close because she knows she has the potential to destroy anything she loves. She thinks of herself as broken but she doesn't realise just how strong she is until Aden shows her. They are probably one of my favourite pairings of the series, on the surface they are so different but they need each other and the connection between them is palpable. I love how slow build their romance is, it's obvious from very early on how they feel about each other but Zaira is very wary and skittish and it takes a long time for her to completely let Aden in. Watching the connection build between them was brilliant and they completely made my heart melt. One of the things I always love most about Nalini Singh's books is the way she is able to include so many other characters without taking away from the couple who are currently in the spotlight. We get a chance to catch up with most of our favourites from both the DarkRiver and SnowDancer packs as well as meet the new RainFire leopards who I'm hoping we'll spend a lot more time with in the future. I loved the RainFire alpha Remi and really enjoyed the interaction between him and Aden, Remi is able to give Aden a lot of advice that is going to have a massive impact in the future and it was great to see a strong bond starting to form between the three Changeling packs and the Arrow squad. I think we're really building towards a point where each of the three races are going to be able to live in harmony and I can't wait to see more interaction between the various groups. Of course not everyone is happy that Silence has fallen and there are definitely people out there who are determined to stop the alliances that are starting to build. This new threat is certainly going to leave a mark and I'm looking forward to seeing how things progress as the series continues. I love this world, I love these characters and it's going to be a long, long time before I'm ready to say goodbye to any of them. It goes without saying that Nalini Singh is one of my favourite authors and I can't recommend all of her books highly enough.